Tom Kastle has hosted nautical events such as maritime festivals and tall ship gatherings, and parades of sail in cities from Newport to Los Angeles combining his performing skills with a solid background of years working, hands on, aboard sailing ships. He has the knowledge and experience to consult in matters of maritime folklore and traditions, 19th century ship rigging, and day to day operations of sailing vessels. 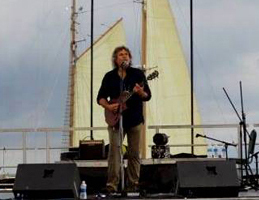 Tom Kastle has performed maritime music and stories at festivals and maritime institutions throughout the US, from Mystic Seaport to San Francisco, in Europe from the Netherlands to Poland, and in the Pacific in Auckland, New Zealand. 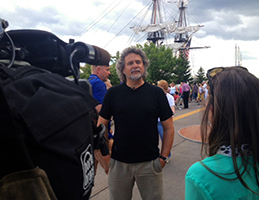 He is a co-founder of the Chicago Maritime Festival and taught a class in sea music at the Old Town School of Folk Music for many years. He accompanies himself on guitar and concertina and can muster a small nautical band for any occasion. "What do you say about a guy who can command a tall ship and all her crew, whose songs can make an Irishman cry tears of pure Tullamore Dew?" All content copyright ©2018 Tom Kastle. Site design by Dan Keidl. Have a nice day!